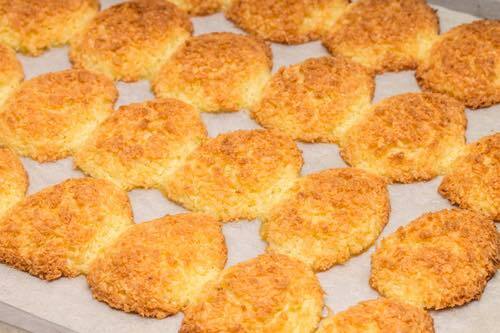 Thanks to Grandma's coconut cookie recipes, you can make old fashioned cookies that are uniquely delicious with the moist, chewy taste of fresh coconut. Everyone loves to eat them! So, don't miss trying them. They are always delicious for nibbling on, and they make a wonderful homemade gift for any occasion. 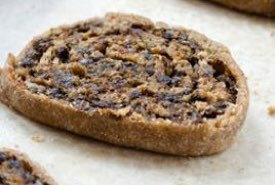 Coconut (also spelled cocoanut) has been a popular cookie ingredient for generations as coconuts were easy to transport and inexpensive to buy, especially during the nineteenth century when many of these recipes were written. Two eggs, 2 cups sugar, 1/4 cup milk, 1 cup melted shortening or oil, 3-1/2 cups flour, 2 teaspoons baking powder, 1/2 teaspoon salt, 1 teaspoon vanilla. Beat eggs, add sugar, milk, and melted shortening or oil, and mix well. Sift flour, baking powder, and salt together and add to the first mixture. Add vanilla and mix well. Chill. Roll out thin on a slightly floured board. Cut dough with a round fluted cutter, brush each cookie with a little milk, and sprinkle with coconut. Place on a greased baking sheet. Bake in a moderate oven (350ºF) about ten minutes or until brown. 2-1/2 cups sifted all-purpose flour, 1 tsp salt, 1 cup butter, 2/3 cup sugar, 2 tbsp grated orange rind, 1 tbsp grated lemon rind, 2 eggs well beaten, 1 cup shredded coconut. Sift flour and salt; beat butter until it is creamy; add sugar beating all the time; add orange rind and lemon rind, beaten eggs, mix well; add 1/2 the flour, mix; stir in the coconut, add rest of flour, mix; drop on ungreased sheet and bake 375ºF 10 minutes. Cream 1/2 cup butter and 1 heaping cup sugar. Add 1 well-beaten egg, 1/2 cup sour milk, 1 level teaspoon soda, and 1 teaspoon baking powder. Add gradually 3 cups flour and 1/2 cup shredded coconut. Roll thin and sprinkle with sugar. Bake in quick oven. Flavor or not, as desired. One cup grated coconut, one and one-half cups sugar, three-fourths cup butter, one-half cup milk, two eggs, one large teaspoonful baking powder, one-half teaspoonful of extract of vanilla and flour enough to roll out. Into two and one-half cupfuls of pastry flour, rub with the hands one-half cupful of butter. Add one cupful of sugar, one and three-fourths cupfuls of grated coconut (that which comes by the pound is best) and two saltspoonfuls of cream of tartar. Beat one egg and stir in; dissolve one saltspoonful of soda in boiling water and add, molding the mixture well together with the hands. The cup of thick cream makes these coconut creams rich tasting. 2 eggs, 1 cup sugar, 1 cup thick cream, 1/2 cup shredded coconut, 3-1/2 cups flour, 3 teaspoons baking powder, 1 teaspoon salt. Beat eggs until light, add sugar gradually, coconut, cream, and flour mixed and sifted with baking powder and salt. Chill, toss on a floured board, pat, and roll one-half inch thick. Sprinkle with coconut, roll one-fourth inch thick, and shape with a small round cutter, first dipped in flour. Bake on a buttered sheet [in a moderate oven]. Coconut meat prepared from scratch tastes so much better than the shredded store-bought coconut, and you get to drink the ambrosial coconut water too. A short video and easy instructions reveal the secret of opening coconut shells almost instantly. 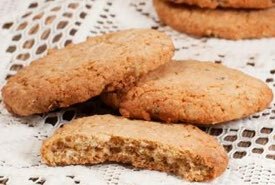 Return here after you've watched the short video and choose one of Grandma's coconut cookie recipes so you can begin baking these special treats.